2019 and no airplay support? Baffled that this app continues to lack airplay support. So I can only listen to my liked songs anything else it would give me an error, couldn’t search or play music from the home page, so I deleted the app and redownloaded it. It asked me to sign back I n and now reads error at the sign in screen as well. Soundcloud is the best platform to upload music. Because SoundCloud is free for hours of music to be uploaded, It’s the best place to upload any music or sound clips that you want online. 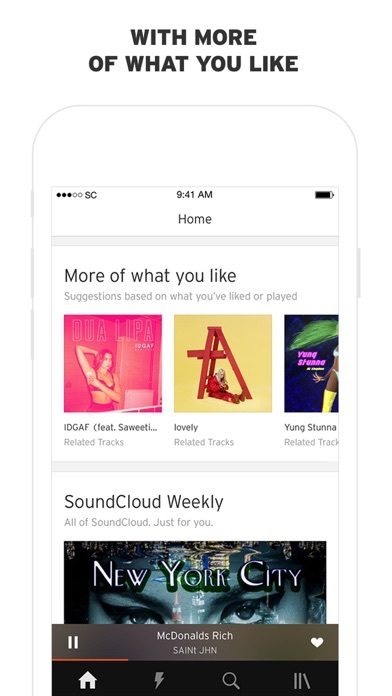 Soundcloud pro let’s you not only see exactly who is listening, but you also get paid if you’re content is popular. I particularly like how you can play any song you like for free instead of just shuffling as you can only do on Spot.ify unless you get a monthly payment. there is some serious talent on here!! 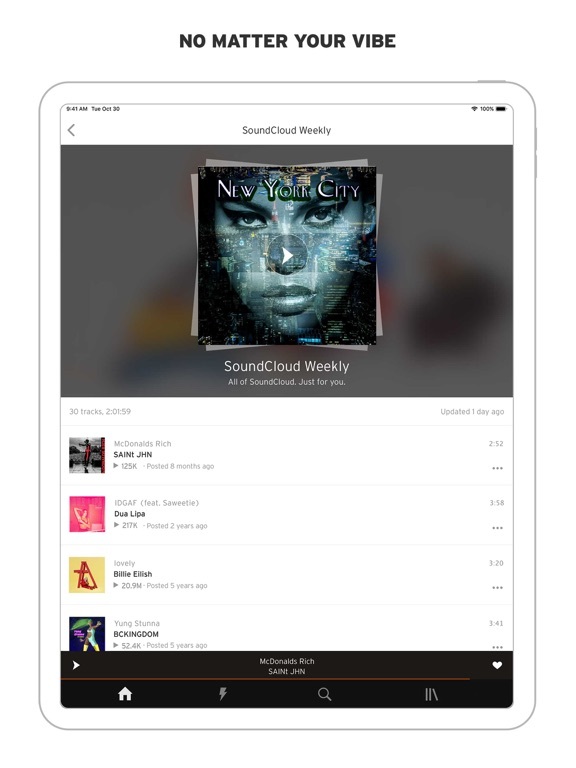 SoundCloud is a great app to use for listening to lots of music and entertaining audio projects. It’s also a great tool for people trying to make a name for themselves and distribute their own content. The iOS SoundCloud app is consistently one of my most used/frequented. Your service offers me something unique that many other music streaming services are unable to provide: electronic sets, songs and remixes that may never surface elsewhere on mobile. That’s great, and why I’m a member of your subscription based services. However, the inability to easily access reposts and likes that may be at the bottom of my stream feed is extremely frustrating. I’ve been using SoundCloud for years, which means those items could be thousands of files away. All I can do now is scroll, and scroll, and scroll until I find what I’m looking for. That’s less than ideal. Would it be possible to add a quick scrolling feature that would make this process easier? If you cant find what you’re looking for on apple music or spotify, hit up soundcloud guarantee they have it, at the same time the layout is sort of cancerous and difficult to maneuver. I wouldn’t pay for this when Spotify and Apple Music are clearly better (and cheaper for students) and a lot of the top songs now are “preview only” unless you pay...so the whole purpose of the app as free streaming is gone. Only reason I use this app is for old channo otherwise I’d delete. I love the app it’s amazing but it just started this thing where it keeps popping up saying “upgrade to SoundCloud go” and it’s getting annoying. I wish they would just let me listen to my music and if I want SoundCloud go I’ll get it but I don’t so stop the pop up ad, please. One of the recent updates removed the “all tracks” tab for artists which makes it nearly impossible to listen to any given artist’s songs in order without going to specific albums or playlists. 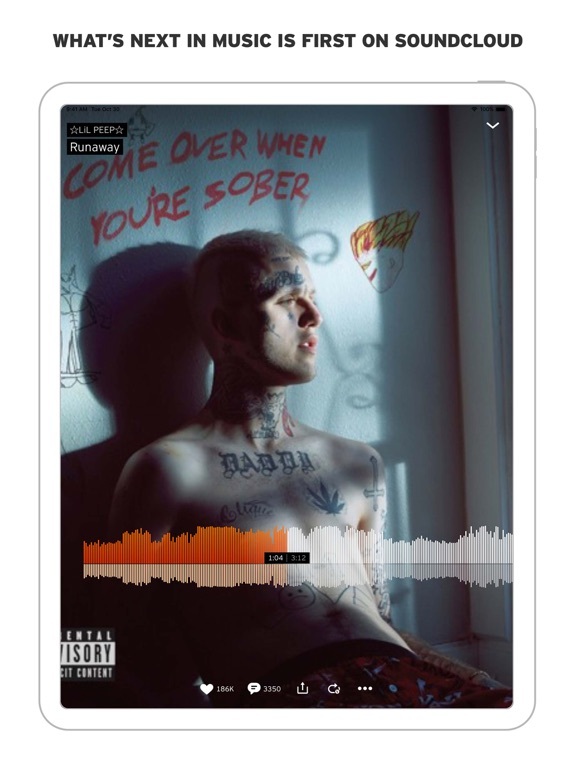 Big artists like X and Peep released and reposted a lot of their tracks and they were easy to find under the “all tracks tab” but with the removal of this feature finding them all is a major haste. I love the platform otherwise but I really wish you would bring back the “all tracks” tab. Now half my favourites won't load unless I click on the artist and play the track from their page! I think it’s a great platform, but there’s this one thing i kinda miss; I remember there used to be this section where the artist would put a description with links and other stuff, the info “tab” if you can call it like that, i think it would be cool if it came back. I absolutely love this app, however I wish I could edit my profile from my mobile phone instead of having to access it from a computer. It’s just so much more difficult and inconvenient having to go back and forth simply to edit a profile. One knock that I’ll give them is that they don’t really allow you to make changes to your profile. I can’t update my picture, change my bio, etc. Hope we can fix that soon. This app has way too many bugs. Songs decide not to play anymore after I’ve listened to the full song a hundred times. SoundCloud programmers have to fix these bugs this is ridiculous. I’ve had the app for years and every other day some songs decide not to play, not to load and all because of the bugs and mis programming done by your app developers. Fix these bugs already or I’m going over to Apple Music. I love this app but once I log out, I can’t log back into my previous account no matter what I do and I’m sure I’ve already made four different accounts and I keep losing all my music. Please fix this, it’s starting to get more than infuriating. This is revolting, insulting and pure piss. 30 second ads you can’t skip after every single song. Clowns. I started using Soundcloud after I cancelled my Spotify Premium just four months ago. I had heard about Soundcloud by many people due to one’s ability to post their own music in hopes of getting recognized. The purpose of Soundcloud is to give one the ability to not only listen to music that is well known but also to let those who have a dream in the music industry to pursue it by being able to upload their own tracks. The main strengths of Soundcloud is the unlimited skips, little bit of advertisements, and ability to choose any song to play. The unlimited skips is something I am extremely happy with because if I do not like the song I am listening to and can’t take out my phone to change it I can simply skip it until I get a song I love and enjoy. The unlimited skips gives one the control over the music they are listening. They can easily change to the next song or go back to the other song. I also like the fact that Soundcloud does not put ads after a little bit amounts of skips have been made. For example, on Spotify after you skip like three songs an ad will play and that is something I disliked. If ads do play they are not long and after one plays it will take awhile for another to come up. That meaning that you can skip how many times you want without worrying for an ad to interrupt. The last strength I mentioned was one ability to post their own music. Soundcloud allows one to reach their dream someday. For example, I know many people who have dreams of rapping and getting their music out and they use Soundcloud to do so. 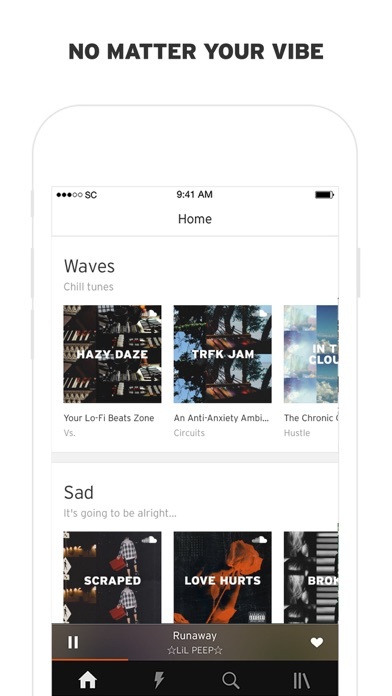 Soundcloud allows others to hear music from people they can relate to and are close in age. There are many teenagers going through the same things and one may do music that the other can listen to. The only weakness that Soundcloud has is the fact that the most famous songs by famous artists have to be purchased in order to listen to it completely. This restrains people from listening to music they love. For example, one can’t go on Soundcloud and hope to listen to John Legend’s actual song without having to pay. Overall, I give Soundcloud a B just because of the only weakness it has. I enjoy everything else it has to offer. I am fine with the music I am able to listen to with this app so I will not complain about the one weakness. 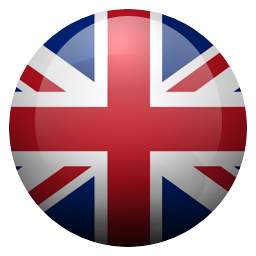 This app is for everyone to enjoy and I enjoy it very much and use it everyday. 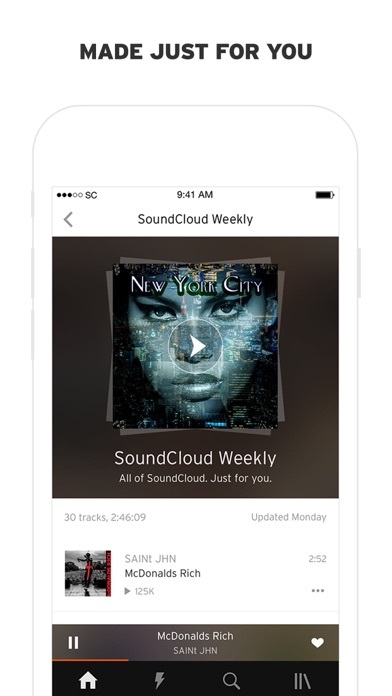 SoundCloud used to be my go to app for streaming is it seems like all they care about is shoving adds in your face. They even increased the length of ads you have to listen to. I was using Apple Music, but I started running into issues. I enjoy SoundCloud. Not really any problems to speak of. Best song app ever, you can find whatever you need, highly recommended to friends. He gives me a lot to think about my Catholic Faith. Soundcloud is the best kept secret! I had someone suggest a podcast on SoundCloud which led me to find the amazing abundance of what SoundCloud truly is! I’m GRATEFUL for finding this amazing app as I’ve been dealing with HUGE stress and the meditation music has been a godsend. Love building my own playlists and different ones with such awesome flexibility. SO MUCH BETTER THAN PANDORA! App terrible interface but desktop great! Make them the same! The app is so terrible compared to the desktop version. The searches never come up the they do on desktop, I never see my page with my spotlight 5 tracks when I open it up, i have to scroll forever just to get to what is normally right there on my desktop.... the app gets ZERO. As an artist and some one and I are talking about music and who I like and what I sound like I’d like to be able to easily show them or find the name of the musician I was listening too earlier that day etc. I have more specific complaints but these are the ones that come to mind. The ‘usability’ and ease of interface is just terrible on the app version. I gave an 8 or something for the recommendation of SoundCloud to people but , it would have been a 10 if the stupid interface on the app wasn’t so clunky. The two interfaces (desk and app) should look and work essentially the same. A girl told me it was impossible for her to figure out how to repost my song on the app version. she gave up in frustration. In some way that reflects on me and I lost a precious repost. Also I’d like to be able to link my two accounts , even if it is just slightly more a month to have both on premium. That last note is not about the app obviously. Thanks for listening. So I don’t really write reviews, but I have an issue or two (maybe more) with the app that really bugs me. One: the pause/play button on the control center/lock screen. I tap the pause button, but the music keeps playing anyways. I have to soft reset my phone each time, and it’s exhausting. Two: sometimes my music starts to crackle. It’s rare, but it’s so annoying when it does happen. Three: when I add a song to a playlist, it adds it all the way down to the bottom instead to the top, and when you have a long playlist, hitting edit at the top, scrolling all the way to the bottom, and waiting for the song to be dragged all the way up is also exhausting. Four: sometimes the time stops, so the song will be going, but it’ll say something like 0:10 when it’s just about over. And to fix it, I have to drag the dot to a different time, hoping it’ll land on something close, but when you don’t know what second it’s on, it’ll mess up the song, and ruin the listening experience. Other than that, it’s easy to use. But please fix these four problems. FIX REQUIRED: Latest update has songs making cracking/popping noise when playing music. Happens whether online streaming or playing offline saved songs. Not HW issue--only seems to happen on this app. Please troubleshoot! Recommendation: A repeat button for mobile (single and playlist). Otherwise, SoundCloud is awesome. This is my #1 music discovery tool. I have discovered so many new genres and artists I had never heard before using this app, and I love that the artists are free to post ANYTHING instead of only their studio-ready work. Sometimes the experimental stuff is what is most interesting. The freedom of musical constraint is what makes SoundCloud really the best streaming service to me without the overhead of video (like another streaming service I also use to discover music), and it also gives me control in what I want to hear. The recommendations have been spot-on (again, introducing me to new music I've fallen in love with), and I hope SoundCloud continues the way it's been and improves with our feedback! Everyone knows all the good things of SoundCloud like growing new artists so fast and helping people find new music. I’m gonna give a few suggestions for it though. Things that I want in the app; the computer version is great, but you know we all want music on the go and most people use their phones. As a producer with my own page I would like the messages to be on the phone and comments and more interaction with my fans on my phone. Everyone knows there is bugs, but I’m sure the SoundCloud team is fixing them now. I’d also suggest maybe better pages for artists. I find it may be hard for new users to get used to it. It’s a little big maybe scale it down to fix more on screen. Anyways, great app! Suggest it if you love music :) Update: right after writing this I discovered SoundCloud Pulse which I think is a great app. Though I’d still like to see you being able to respond to DMS, have social media links on artist pages, and have descriptions on artists pages. Ok, never thought I would write one of these, but I need to set this straight, just in case I’m not crazy. I love soundcloud, I really do. I’ve been using it for ages and it’s one of the only music apps that lets you stream underground music instead of mainstream music, of which I listen to more often. However, it was definitely better before. Not sure when, but years ago I used SoundCloud ad free without payment. It was awesome, it really was, and ads came up maybe one a day. However, one day, more and more ads came up, however I could skip them after like five seconds, so it was fine. But recently, around a couple months, I’ve been getting 30 second non skippable ads that come up after every like two songs. This is absolutely outrageous. I don’t mind an ad or two, but this many is just awe full. If you are going to throw ads at me like this, use banners. Really. And if you still can’t do THAT, at least make the ads easily skippable, and definitely not 30 seconds. No one is going to see this I’m guessing but I had to vent. First and foremost: Thank you Soundcloud, you are brilliant! You have somehow managed to accomplish the impossible: create a global platform for musical expression for artists who otherwise would never be heard AND deliver that to we humans hungry for food-medicine-energy that IS original music without bowing to cavalier monetization. Haven't a clue how you surpassed Apple, Google, Pandora and the rest save only for how amazingly perfect a team you have created. You are the Shaolin Monks of Music. You ARE the revolution. That said, you new App is genius! Crisp, clean, low footprint, perfect maximization of OS and platform utilization and the aesthetic attention to detail is both subtle and sublime. Outstanding accomplishment! As far as the whiners who confuse web with apps and have never coded a line - ignore them; this version of you app reflects the excellence and vision that guides your exquisite and critically necessary presence on earth. Gratitude sisters & brothers - inspired use of tech & heart - love this app! SoundCloud I hope your reading this. The one thing that is keeping me from uploading more tracks and being able to see all the people who has liked or listened to my tracks like I used to is SoundCloud Go. I know you guys are probably losing money and your money thirsty but it doesn’t mean you have to have all these aspiring music producers pay monthly just to upload more tracks or view all the likes or listeners, just have people pay monthly to stream exclusive music and nothing else. I’m sure a lot of people would disagree with me on this but for a somewhat broke producer who’s paying monthly for other subscriptions, I just don’t have enough money to pay for SoundCloud Go, just to upload more tracks and other stuff I mentioned earlier. I hope you guys understand and wish to fix this problem that me and probably a few others are going through. Now, all you guys have done is rearrange some icons and make the app look somewhat cool, but you guys haven’t added anything new yet to the app which means I’m still very very disappointed. After every update this platform has made, it keeps getting worse. These advertisements are really starting to get annoying. You used to be able to scroll around SoundCloud and look for other tracks while an ad is playing but now the app forces you to look at the still frame ad while it plays and sometimes you can’t even skip it. Something that also gets on my nerves is when I get two ads in a row or after every other song. Stop forcing us to watch the ads, it feels really anti-consumer and like you don’t care about your customer. Also, its not just the ads themselves that are annoying but the lack of variety. I swear I’ve gotten the same CAPITAL ONE BANKING AD 5 TIMES IN A ROW and it really makes me never ever ever to so business with them. Same with Home Depot, in order to retain customer happiness there should be less ads and if that isn’t possible; at least make it so they aren’t as intrusive and repetitive. I love the app though and have been using it for years. I love SoundCloud i tell everybody about it it has a great mix or new and old artists. From people who are already big to helping others reach that goal, that’s one of the reasons I love SoundCloud. However, I just got an iPhone and im not able to “add next” to my songs which means instead of being able to in a sense create a playlist I have to go look and wait for one song to be completely over then click my other one.. Instead of just have it play next and be ready. I have no idea why this was removed or if it’s just for iPhones or what but it’s terrible. I would love if this feature is back so i can stop having to look through my 300+ songs play the one I want next instead of just adding it to the que . Bring back the add next buttons and the button that allows me to see what’s playing next and so I’m able to switch them. Bring them back! Been using SoundCloud for a couple years, everything checks out except when I am listening to SoundCloud through my blue tooth speaker, after a song ends and it goes to the next one, it just randomly stops playing. Then after another song comes on then it will work. Nothing to major just a little annoying. I have restarted and rebooted my phone as well as my Bluetooth speaker numerous times. Hoping this can be fixed. Thanks y'all. UPDATE : you guys deleted all of my liked tracks which was my playlist essentially. And now it fails every time I try to sign in. I’m trying to change my password but can’t even do that. Give me all my liked tracks back and the star rating will go back to 5. Final Update: liked tracks are coming back. Not sure what happened. Thanks for the fix, if not then I’m glad the glitch fixed itself out. This app has always been my preferred method to post my music to. I’ve been a creator nearly 3 years and it’s just a useful tool to spread your word. Anyways, I have friends who are telling me they can’t repost my content, basically they attempt to repost but it doesn’t show up on there profile, I don’t receive a notification either, we decided to test it out, and yeah there’s certain artist that they tell the user they reposted the track and it never did, never shows up, yet when they re post bigger artists it shows up immediately, so what I feel SoundCloud is doing is restricting smaller artist from “to much recognition” Why do you allow bigger artists content to be displayed as repost but not artist at the bottom? If I can figure this out, I will post more info, but that just seems weird. Other then that the app is amazing. I referred maybe 10 friends already to this app. This last version. I took a chance and still downloaded it, it’s broken. Crashes on each song I play. Maybe you should stop running all those ads? Every 2 songs there is a new ad “please upgrade to SoundCloud go” you have now convinced me why I shouldn’t update and wait for jailbreaks to block all those ads. You want to tarnish your name so bad that you put so many ads that it crashes your app. Good job! Driving back from a outing and sitting with a girl listening to ads, awesome. Why would I do that? I already pay for other things. We normal people can’t afford to buy so many useless subscriptions here and there. I can’t believe this. Also seriously, what happened to the easy way to get to playlists? They used to be big icons easy to click now as I am driving I can barely see my icons which discourages me from using this app, if I can’t see my playlists I won’t use the app. Period. I’m a veteran user from iPhone 5 (7.0.4) to iPhone X finally and each upgrade I get with my phones your app gets worse. How is that for useless programming? Okay so I’ve been using SoundCloud for quite some time now, and there’s no errors or glitches with me. I also like that I can use it across all devices, including my laptop. But when I got on my laptop to use the website, I noticed how much better it was than the app. Let me just get to it, it had some basic features that every music app should have, and the computer version has these features but not the app. 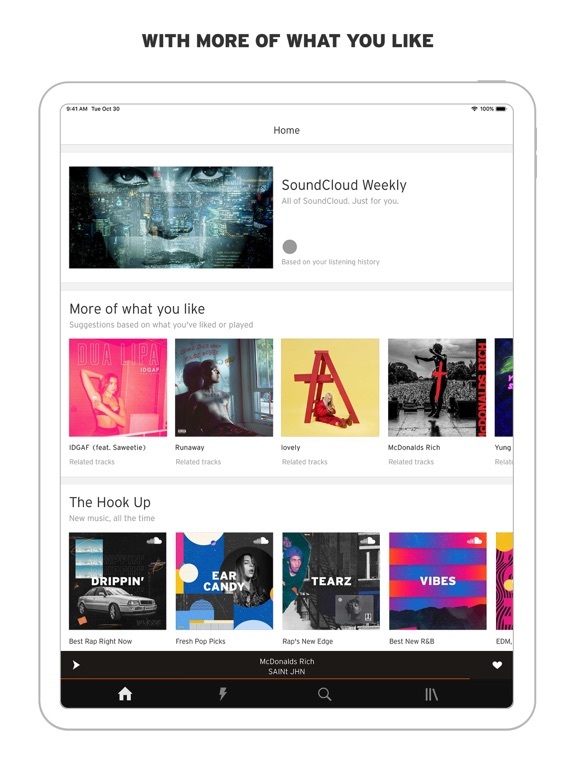 Some of these features include things such as adding songs to up next or being able to start off a song first and then hit shuffle, rather than just going to the playlist and hitting shuffle. It’s very annoying when you have to constantly flip through songs just to hear a song that you like but then having to go back and shuffle again. So as a summary I would say this is four and a half stars but it doesn’t give me that choice. I really love SoundCloud, and I love to listen to it outside, but for a while now it’s been completely draining my battery in just thirty minutes. For example with today, my just ten minutes ago was at 70%. But in a matter of minutes, I see it drained all the way down to 61%, then went to 59% just fifteen seconds later, and then suddenly my phone just shut off, and when it finally restarted after plugging it in, it was at 10%! Now I have to wait TWO HOURS just to for it to charge back up, only for the same thing to possibly happen again. That’s absolutely insane! This problem only happens when I’m using SoundCloud, and it happens nearly every time I use it! I just want to listen to music and enjoy my time outside! But now, I’m stuck in my room waiting for my phone to charge again because of this problem! Please, if anyone holds the advice to make my battery go down slower, I would very much appreciate it! I don’t normally write reviews, in fact the App Store didn’t let me write this until I uninstalled the app and reinstalled it because of a glitch, but I have to emphasize the importance of this. In the patch notes, it details performance enhancements and bug fixes. However, this new version severely increases the startup time. I now have to wait a solid minute on a loading screen before I can do anything whereas before it took half a second. I don’t know what causes this, and the app still functions otherwise normally. However, this new loading screen before the app boots up takes an unacceptably long time compared to what the load times previously were, and is especially awful considering that barely anything was changed within the app, yet the load time is multiplied by probably more than 20 times what it took prior to this update. If you haven’t updated yet, PLEASE WAIT FOR THEM TO FIX THIS, because it is severely hurting the functionality of this app. I’ve been a long time user of this app and tbh, it’s my all time fav music app to use anytime and anywhere I go. But can you please add a search option in the likes page as there’s a bug I notice where my liked music from months back doesn’t even show up in the search and it’s one of the songs I actually liked to save it in my profile !! This will make listening to old music saved in my collection much easier to browse and listen to , instead of me opening my collection and scrolling down through 100’s of songs just to find that one song that doesn’t even show up on the regular search section. Above all this app is great and I love it but that feature will honestly be the best thing if you can make that possible. Cheers. My best friend and I started a podcast that we wanted to do for years now! We didnt know much about anything but recording at first and we took a shot on SoundCloud! At first we were gonna use it as a steppingstone to be heard, but here we are 6 months later with ten episodes and over 1000 listens!! We stuck it out with SoundCloud and use the pro package for 15 bucks a month and are finding more ways to be heard from soundclound and what they are offering us!! I am so happy that soundcloud helped us to where we are now just ended season 1 ten episodes and it was a blast worth every penny!! We are planning to stay with SoundCloud no matter how far our audience stretches next season because they helped us get heard!! Thanks soundcloud #77loungepodcast episodes 1-10 are up!!! I have been a SoundCloud Go member for over a year now and SoundCloud has always been my favorite streaming service, until now. Currently, the app uses data to play songs that I have downloaded so I can play them offline and when trying to change songs it continues to play the original song while showing the song I clicked in’s cover photo. Once this happen I can’t swipe right or left on the song in the listening tab even if the song is part of a playlist and if I press pause or play those actions happen for the original song and not the one who’s cover page I’m looking at. I have never seen problems like these in the app and have always been a loyal SoundCloud Go user, however if I can’t even listen to the music offline that I’m paying for it then why would I pay. My profile name is Gleason1214. I hope these issues are addressed and when they are I will resubscribe. Note: I would give a working SoundCloud app 5 stars. Sophomore year I started using SoundCloud to listen to music on my laptop in class. I love underground hip hop & some artists can only be found on the Cloud! A couple years later, I decided to start making music. I found it beyond useful for uploading, promoting, & sharing my crews single joints, records, & occasional personal streaming. I started using the website/app years ago for solely streaming, once I started making my own joints, I thought it was so dope to have my own stuff up for the world to hear! I still use it today. I love the fact that it's completely free & doesn't use much data or require much to run. I'm up on other platforms as well, however, SoundCloud will always be in use as long as I'm releasing/streaming music. Soundcloud itself is spectacular, amazing site. The service and all of its features (with the exception of a replay feature which for some reason is not there) are great and reliable. Talking about the app itself, it crashes a lot, when I was running it on iOS 11 on an iPhone 6s it would crash and cause my phone to restart at least once every 5 hours of use. Now I’m running it on an iPhone 8 plus and it still crashes a lot, at least once a day and I probably use the app for around 3 to 5 hours daily. Should also note that I am a paid user. Not much else to note except for some latency when pausing and playing a song by tapping, there’s pretty obvious lag there. 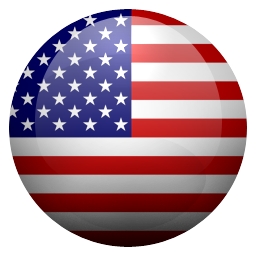 Overall good app, great service, but crashes a lot. there is a lot about soundcloud that i love and a lot that i hate. I love that it allows creators to make their projects visible to the world. But any song with any kind of traction will be plagued with comments of self promotion from artists who are, to put it gently, bad. My largest complaint is the fact that all of your account activity goes directly on your account and cannot be hidden. So If i want to post a track, my original song will be listed right by my liked tracks. That whole system is idiotic, why would i want to blast everything that I’ve liked on my account? Same thing with subscriptions. Soundcloud suggests to just create a private and public account, but this idea is simply stupid. we should just have the option to make this stuff private, problem solved. I loved this app because of the way it’s designed, like how u can create your playlists, it’s very easy and convenient to organize your music on your playlists. I also like the thousands of different songs that are on the app. One thing I dislike though is sometimes you can’t listen to the direct song you are looking for unless you have SoundCloud premium. Maybe you guys could make some of those songs available for free, I think that would make the SoundCloud experience better. Another thing I didn’t like was the multitude of annoying ads and that you have to pay to get rid of them. But overall I like how easy the app is to use. And I still have the app and have been using it for some time now and have been enjoying it. I’ve always had a craving for the salty cold water air since infancy, the touch, smell, sight of my surroundings, taste, and hearing, all my senses combined in one. Giving me a nostalgic feeling at the time knowing I've never experienced such a feeling before in my life because life had just started for me. It was as if i had experience this life experience but just reliving it. A profound moment in my life was when i went camping with my dad near the coastlines, that morning around 5:00 am, As I was gazing across the endless beauties of the south African sands, the sun was beginning to rise. Waves lapped against the shoreline creating an intricate pattern along the smooth sand. Innumerable milky puffy clouds floated over the blue skies; some shaped like castles or mountains and others looking like white silky sheep. 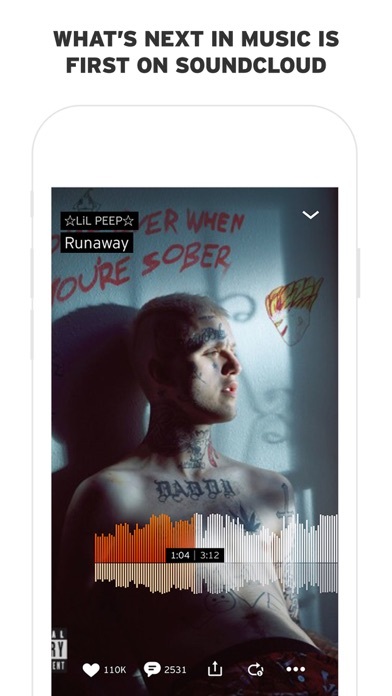 I start of remembering the SoundCloud app having a record/upload button, so let’s just get rid of that even though you could upload on the fly. Did you know that the website version of SoundCloud has a internal messaging system? Oh wait not on the app, wouldn’t it be cool to share your music without leaving the app? Too bad it’s probably too hard to implement. Song advertisement song advertisement song advertisement, not planning on paying for another thing that gives me a couple of benefits and won’t change much. Spammed with advertisements from the minute the app opens to between every song. How about a refreshed look? But don’t mess it up. Every other big app has had several changes in look and I dunno this apps been pretty much the same since 2013. Besides small changes like moving the stream and streamlining the playlist/likes page. How about a refreshed now playing screen, easily accessible profile section, and messages. I don’t want to be rude, but I’ve used your service since the pre-ad, hej days. It’s a major platform for independent music, I think it’s just stupid to throw away all the opportunities to make the app better and focus on spamming us with a payment tier. At least free users can pick the song they want to play and not have a forced radio like everything else, but the app is still missing a lot. I went from just browser listening years ago, through the iPad app, and now to the iPhone app. My androids never had the capacity (I always had 16gb or lower androids with my old carrier), so I’m sure it’s awesome on that platform too, but I’m so pleased to get access to the rare tracks SoundCloud provides from friends, international acts, and underground strangers alike. My password was saved from my account from the iPad, and still saves my old rare favorites from years ago. For example, no other audio app has my friends Jabari Exum & Baye Harrell on their 1999 cut featuring the poetry of Chadwick Bozeman, or my favorite cover track, Hiatus Kaiyote’s version of “Dare” by the Gorillaz. Thanks SoundCloud for saving all my little treasures in life. i’ve been using soundcloud for about a year now and i love it. i love that i can find most of my favorite songs on here, follow and like my favorite artists etc. another thing i enjoy ab this app is that it is a great way to find new music from the wrists you follow or recommendations. but the other day i was trying to add a song to my playlist and i couldn’t because i had 499 songs so i had to delete some. i found this very irritating. also, whenever i try to delete songs it won’t let me. i tried everything so i decided to delete the app and reinstall. lastly, i feel like there isn’t a wide variety of music, mostly just rap. if i ever try to find a rock song for example it will be someone singing it and i can never find the song i’m looking for. 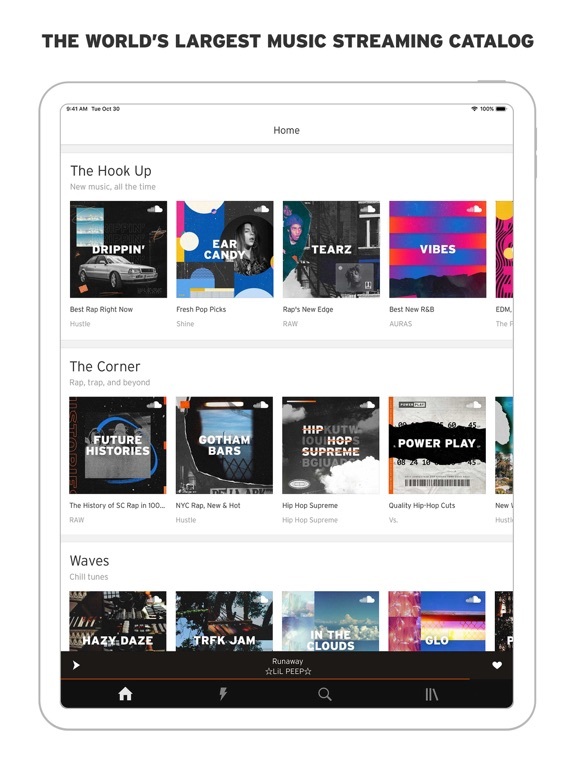 To allow SoundCloud users to go to other apps after listening to SoundCloud & picking up right where we left off on the track we were listening to. Nothing annoyed me more than the app closing and me having to go find the artist, then the track and then searching for where it left off. The only other thing I think needs to be fixed is restoring comments on the mobile app for artist tracks AND making the artist notes visible. For example: a DJ set plays many tracks. Users used to be able to see the notes which most DJs used to list the artist and track titles in their mixes. Now I have to Shazam while listening because I can’t read artist notes. So I really like this app since it doesn’t take too much storage and that’s greatly appreciated. However some of the songs I added to my playlist disappeared and I don’t know why though. I don’t know if it’s a bug or something about the accounts getting deleted but I don’t think it’s fair that we’re not getting any notification in advance of this happening because I believe that we all want to listen to our music and all that. But now it’s impossible to find and specific song since only re-makes or remixes appear and the song doesn’t sound right. And I don’t think it’s a software problem because I currently use and iPhone 8 (not bragging just saying) and iOS users apparently have better experiences with apps. 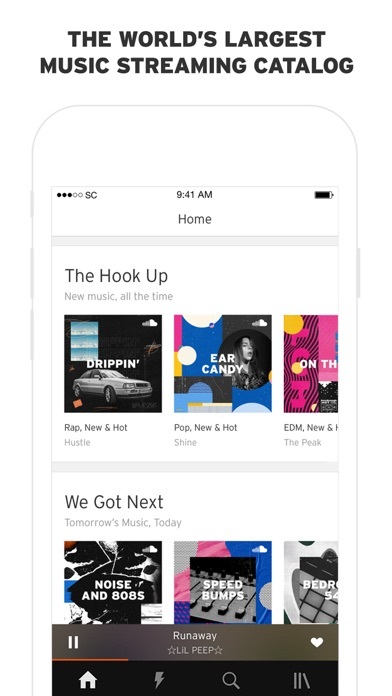 Soundcloud has always been my go-to music app. I always suggest it to my friends to get SoundCloud Go because it is totally worth it. But, I have a suggestion. Sometimes I find a song that I want to put into more than one playlist. It’s very time consuming to have to keep scrolling each time I put a song in a playlist. Especially because I have so many playlists, it takes a long time to find a certain one. So my idea is that you should create an option where you could select more than one playlist at a time, and then you press some sort of button to confirm it. In addition, you could create a search bar to easily find a certain playlist. So I used soundcloud in freshmen year for a few years worked great, I surprisingly liked finding chopped and screwed songs and remixes. I thought I’d hate it to be honest. But then I used SoundCloud as my secondary because I got Apple Music for a year. I came back a few months later to jam some music and it’s AD after AD, like why? ?it’s awful. It’s really frustrating watching the downfall of an awesome app. Ads before we’re once every about 10 songs decent, reasonable and all good now every 3 maybe 4 if you’re lucky. I support the Ads that cover half the screen and the user has to click out of it but still see the ad. It’s much more user friendly than making them wait 30 or 15 long seconds. I mean at this point your better off restarting the app when an ad comes up. I don’t know if anyone else is having this problem, but whenever I put a song on repeat (so that same song plays over and over), right when the song ends, the song just goes back to the beginning and just stays at 0:00. I have to “pause” the song and unpause it to start playing again. This gets really irritating when I’m doing something else while listening to soundcloud. I don’t know if it’s my WiFi or something else, cuz I have it on an iPhone and an iPad, and they are both having the same problem, if you could please get this fixed I would love it. Other than that this is the greatest music app ever!! I never write reviews but I feel like I had to. I’ve been using SoundCloud for a couple years now and i love it but today i went onto the app and it said i was signed out so I tried to log back in but it kept saying that my email or password was wrong but it’s not. I checked it a couple times just to make sure and when I tried to look up my account on my friends phone it said my account didn’t exist and I did not delete my account. I went online to the support center and I emailed them about three times because it kept saying they sent me an email to help me resolve my issues but I have not received any emails and I’ve been constantly checking. I’m very upset and I’m going to keep my review at a one star until my account is restored bc I had all my favorite songs and playlists on there and normally I wouldn’t care but I don’t remember half the names of the songs. Some bugs have been around for a while, but an overall good app. I use this app to listen to most of my music, and it is really great for small musicians to get their songs out there. There are a few bugs that have been around for a while, and I’m not sure if they are exclusive to me or what, but it happens on both my iPad and my phone. The first bug is that sometimes when I am playing a song, it just stops playing at 18 seconds, and it takes a bit of fiddling in order to get that song to play properly. Another is that if I have a song paused for too long, it reloads the app and I have to start the song list all over. That is all I can think of for now, but otherwise a good app. If you are prolific user then you will notice many frustrating bugs that involve likes, crashing, and the artists you follow. For instance, I just experienced a bug that unfollowed me from everyone on mobile. This means that no matter how much I search, there’s the possibility I’ve simply lost touch with some due to them being so underground. Also it randomly unlikes certain songs regardless of how old the like was. It doesn’t show if you’ve already reposted something. It also doesn’t inform you if you’ve already added something to a playlist, which is a huge problem for those making popular playlists for fans. All of these functions are perfectly fine and fixed on the actual site so why not change these problems after all this time with a perfect website? A great place for artists to post their music or music they love and connect with each other! 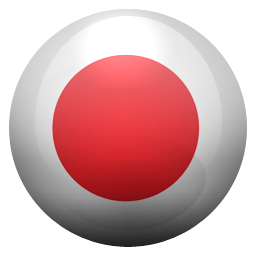 Now, with that said, this is one of the least user friendly and least intuitive apps for musicians/artists/vocalists/etc. You are not able to upload music through the app, you are not able to easily find your profile, you are not able to easily end the playing of a song! You can pause it, but God forbid you tap it by mistake, and it plays again. There should be an option to stop and end the song you’re playing. You should not have to wait until you choose another song. There is no place to view your friends or connections on this. Also difficult to see statistical information about songs you’ve uploaded. Please thoughtfully update! !